Egypt will continue supporting Lebanon in all aspects, Egyptian President Abdel-Fattah El-Sisi said in a speech during a visit by Lebanese counterpart Michel Aoun during his first visit to Cairo since he assumed office. In a joint press conference at the Presidential Palace in Cairo, El-Sisi said that Egypt is confident that Aoun's term will strengthen Lebanon’s character as a country that enjoys pluralism and political consensus, guiding the country away from any attempts to drag it into sectarian or religious conflict. “A free, strong and stable Lebanon is a powerful force for the Arab world, and you will find [Egyptian] support for your efforts to preserve stability and development in Lebanon,” El-Sisi said told the Lebanese president. El-Sisi said that Egypt has always supported the unity and stability of the Lebanese state and has always stressed dialogue as a means of resolving conflicts. Prior to Aoun’s win in the November 2016 presidential elections, Egypt worked to open lines of communication with several political forces in Beirut in hopes of facilitating efforts to bring an end to the country's more than two-year presidential political vacuum. El-Sisi also said that he has discussed with Aoun means of strengthening bilateral relations between the two countries in the fields of economy and trade. The two leaders also agreed on the importance of bolstering trade relations with African countries. The talks also included a discussion on combating terrorism, the Syrian civil war and the resulting refugee crisis in Lebanon. Lebanon has been hosting over more than one million Syrian refugees since the eruption of the Syrian conflict in 2011, according to statistics by the UNHCR. El-Sisi said that the two leaders “agreed on the importance of standing together against the dangers of terrorism,” adding that he expressed the Egyptian army's readiness to support the military capabilities of the Lebanese army. The two leaders also discussed ongoing preparations for the upcoming Arab Summit to be take place in Jordan's Amman in March. “We aim to make [the summit] a success amid the challenges that face the Arab world during this critical period in history,” El-Sisi said. Aoun said that he came to Cairo to assert the strength of Lebanon’s “unprecedented relationship” with Egypt. 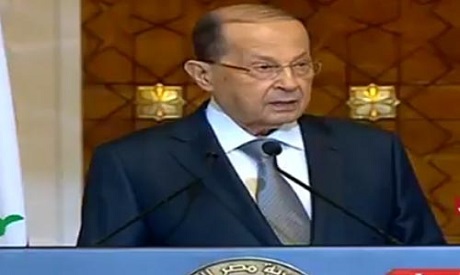 “Beirut relies on Egypt in the attempt to resolve Middle Eastern crises, especially the Syrian crisis, which has affected neighbouring countries including Lebanon,” Aoun said, adding that Cairo and Beirut agree the conflict should be resolved through a political solution. Aoun also invited his Egyptian counterpart to visit Lebanon, which El-Sisi said he would do soon.